RENATE members share events in honour of the 30 July 2018- World Day of awareness against Trafficking in Persons. 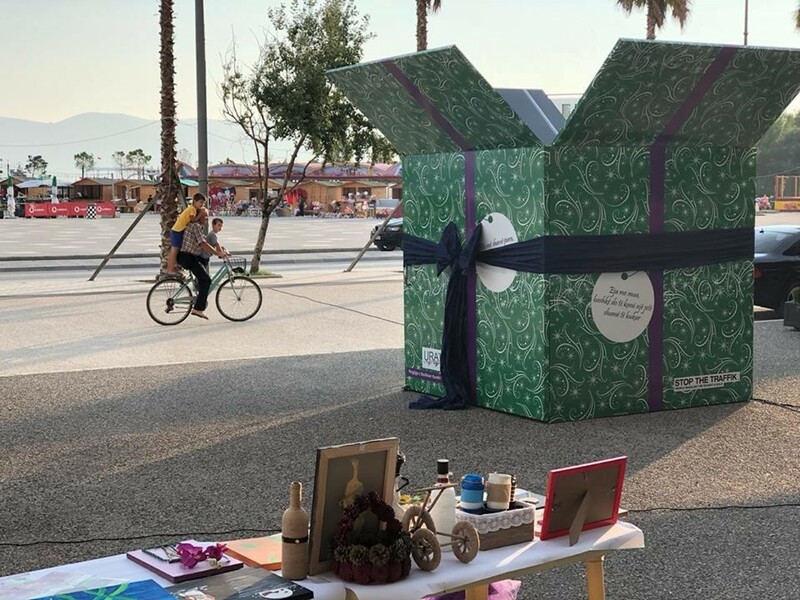 UN GiftBox campaign under way in Albania, to raise awareness about Human Trafficking, in honour of the 30 July, the world Day of Awareness against Trafficking in Persons. On the World Day of Awareness against Trafficking in Persons, 30 July 2018, the URAT network together with the office of the National coordinator for Combatting Human Trafficking and Bridges, a network of organisations dedicated to the fight against trafficking in human beings, brought the UN Giftbox to Albania, for the 3rd year running. The UN Giftbox is a global initiative of the United Nations in the fight against human trafficking. The campaign took place at Lancua, in Vlora, with the participation of Minister Rovena Voda, National Co-ordinator of the fight against trafficking. Also present were Mr. Artemis Dralo, Deputy Prime Minister for Europe and Foreign Affairs, as well as representatives of the Bridges network, local anti-trafficking institutions and national and international organisations. 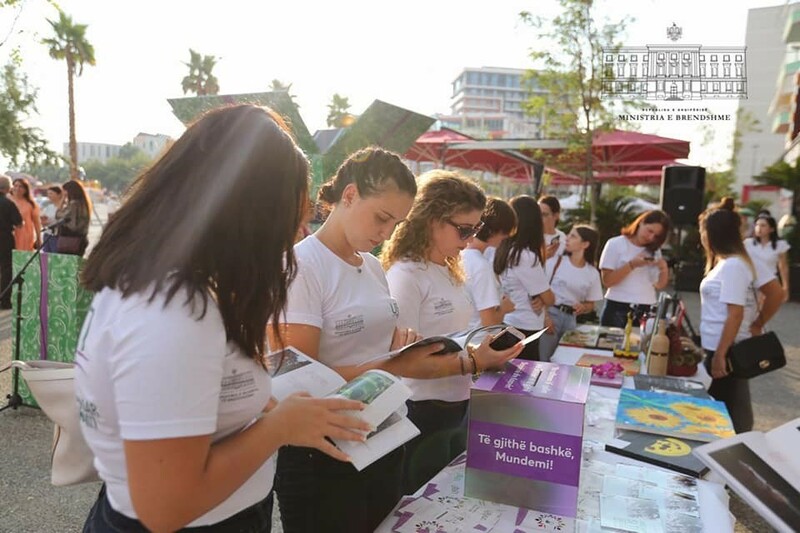 The Giftbox information was translated into Albanian language by the Bridges network in Albania, in order to expose fraudulent promises used by traffickers of human beings, as well as exposing the inhumane conditions of trafficking and its consequences. A unique and eye-catching feature of the campaign is the life-sized Giftbox itself, which effectively captures and informs the public. The overall purpose of the campaign is to sensitize people to the risks of trafficking; help vulnerable communities to protect themselves from traffickers and help survivors of trafficking receive the necessary and re-integrated information in society. Overall, this year’s campaign was another fantastic success, thanks to the collaboration and happy cooperation amongst each of the agencies who work so hard together to achieving the common goal of combatting human trafficking and exploitation. The Blue Heart Campaign against Human Trafficking- Albania. 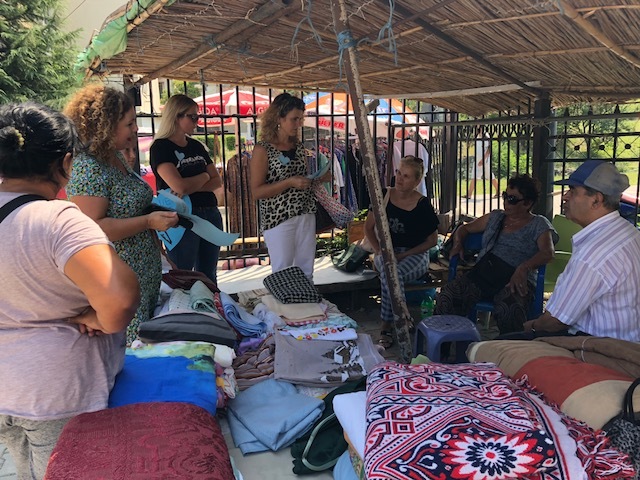 To mark the World Day against Trafficking in Persons, 30 July 2018, Mary Ward Loreto Women’s Project which operates in Lezha city, Albania, in collaboration with State Regional Directory staff of Social Services joined together in an awareness-raising activity against Trafficking in Persons. During this campaign, information was shared about this phenomenon, with parents, children and the Roma community where the exploitation of children is the biggest concern. This is a crime of such international proportions that no one person alone can combat it. From our work, we realise that the best and most effective approach will be through collaboration, where police forces, state structures and civil society all work together. Together we can fight and stop Human Trafficking. Awareness-raising initiative by MWL Youth group, Albania. Mary Ward Loreto Albania Youth group organised a Human Trafficking awareness-raising campaign in Lushnja city, to mark the occasion of the 30 July 2018- World day of Awareness against Trafficking in Persons. It was a most productive time, when young people shared information on human trafficking and also distributed leaflets amongst the ,local community, about Human Trafficking. Launch of Cross-border research to find ways to improve child protection against human traffickers. On the occasion of the World Day of Awareness against Trafficking in Human Beings, 30 July 2018, RENATE members at CHARITA Slovakia send us news from Caritas Europa Associations and the Mediterranean region (near East and West Africa) announcing the launch of a cross-border research project aimed at finding ways to improve child protection against traffickers. This international research brings together Caritas members in nine countries (Albania, Bosnia, France, Jordan, Kosovo, Lebanon, Slovenia, Slovakia and Ukraine) within two regional organizations: Caritas MONA (Caritas Network in the Middle East and West Africa) and Caritas Europa. Research results should provide tools and techniques for better identification, prevention and a more effective fight against trafficking in human beings. At the same time, it is intended that the research will promote awareness of this illegal activity in risk groups, law enforcement agencies and the general public. ‘’Over the past ten years, the Slovak Catholic Charity has helped more than a hundred victims of trafficking in human beings. The project provides comprehensive services: social, psychological, legal advice and assistance in the ordinary life of clients. Our main goal is to re-incorporate a person into society,’’ said Jana Verdura, the voluntary return coordinator of the STOP human trafficking project. RENATE Board member, Margaret Gonzi, olcgs, Malta, shares with us news of the Good Shepherd Congregation’s Human Trafficking awareness-raising talks to the congregations attending Mass at the local chapel on both the 29 and 30 July. Margaret drew upon her work with victims of violence and human trafficking, to talk about the suffering and trauma experienced by victims and yet how through constant support and vigilance, they can become survivors with hopes and plans to live fulfilled lives. An additional event took place on Friday, 27 July, with the screening of the film ‘’Priceless,’’ shown at the Franciscan Cinema at the Emmaus centre, Birkirkara. Following the screening, Margaret’s colleague and co-worker at the Dar Merhba Bik Foundation, Bernardette Briffa, also a RENATE member, was invited to share her knowledge and experiences of working with victims of human trafficking. It was a wonderful opportunity to raise awareness about Human Trafficking and encourage people’s engagement with efforts to bring an end to this crime against humanity. Fields of BOAZ and vulnerable asylum seekers in Ile-de-France- 2018. 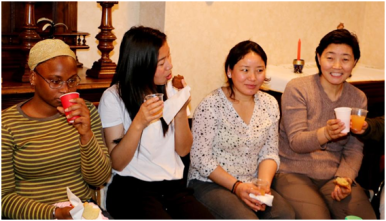 In 2003 in France, 23 religious congregations came together to create The Fields of Boaz to help the most vulnerable refugees in France: single women who arrive alone, fleeing a country because of danger. Often they do not speak French, have sold most of their assets to pay the traffickers who bring them to Europe and only know a few immigrants from their countries of origin, many of whom are not always eager to help. It is now 15 years since its foundation and the need for support continues to be as urgent as ever. Twenty residents – Muslim, Buddhist or Christian – are currently housed in apartments provided by individuals or by Catholic communities in Paris or its suburbs … “Protection from the risk of prostitution or of life on the street, we advocate a full reception of these women…. ” explains sister Eliane Loiseau. Adapted by Anne Kelleher, RENATE Communications. More news of events on 30 July will feature in the coming weeks.